Years ago I used to love going to Asian restaurants and ordering the Singapore Noodles. They were my favorite. It is a one dish meal that sometimes has shrimp and fried pork in it. It is made with vermicelli rice noodles. I have recently made this at home since we don’t eat out much anymore. I loved it. It was really easy to make and it was quick. The problem for me is the noodles. White rice and I do not get along. Too carby with a very high glycemic index. I ended up feeling like I just ate a whole bag of cotton candy. Not good! So this time I tried it with quinoa. It was soooo good. It was even more satisfying and no bloating or carb coma. As a bonus, because quinoa is a great protein source it left me feeling full for hours. Unfortunately, the kids hated it. Unfortunate for them as I will definitely be making this again! garnish with cilantro, green onions, chopped peanuts, lime wedges. Place a fine wire mesh colander in a large bowl. Put the quinoa in the colander and then fill the bowl with water. Let the quinoa soak for a couple of hours or all day if you have time. Soaking will do two things, it will make the grain swell a bit and if there is any sand trapped inside the quinoa it will come out when you stir and rinse it. Soaking will also rinse off the natural reside that is a bit bitter. You don’t have to do any of this if you have purchased pre-rinsed quinoa. Once the quinoa is done soaking, drain and rinse again. Dump the quinoa into a rice cooker and add 3 cups of water and a bit of salt to taste. It will be done in about 20 minutes. You can do this on the stove top too. Just treat it like rice. While the quinoa is cooking. Heat a wok or large saute pan. Add coconut oil and heat. When hot add onions, garlic and ginger. Saute for a couple of minutes. Add red pepper. Cook for another 5 minutes or so. Add curry powder, turmeric, sugar and soy sauce. Add squash, asparagus and mushrooms. 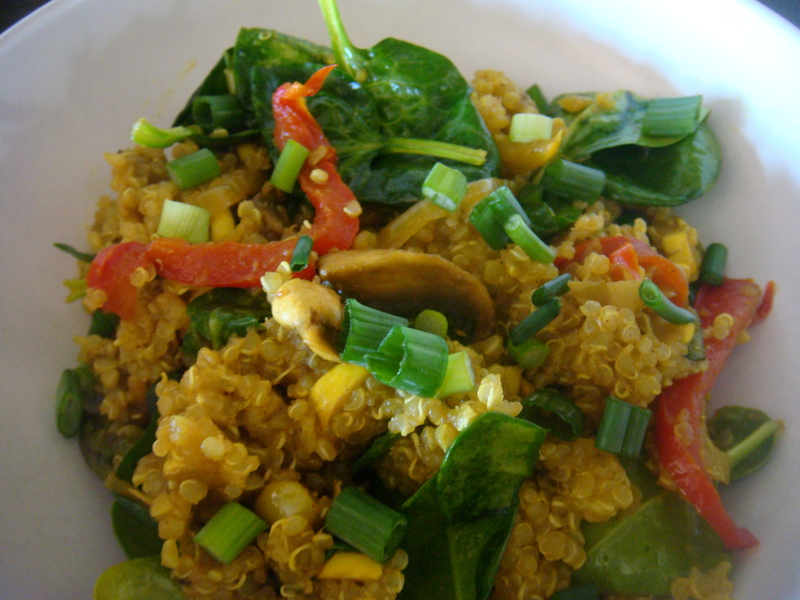 When veggies are done to desired tenderness add cooked quinoa and spinach. Toss to combine. Garnish with any or all the above options and serve warm. We buy it in bulk at a natural foods store. Can you give the name of the store where you buy this. I moved to Singapore recently and I am trying to see which store sells it in bulk. I live in Arizona. Singapore is just the name of the dish. Sorry.